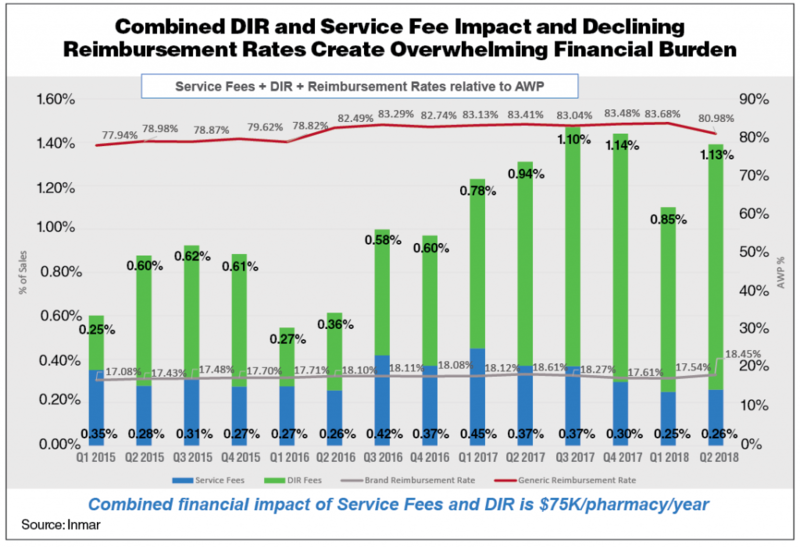 DIR (direct and indirect remuneration) fees are increasing — creating greater and greater financial challenges for retail pharmacies. In the second quarter of 2018, DIR accounted for 1.13% of sales and, year-to-date, it is trending at 1% of sales. For the same period last year, DIR was running at 0.9% of sales. On top of DIR clawbacks, reimbursement rates continue to decline. It’s a disturbing trend in a health care ecosystem that continues to become more retail dependent for patient convenience and lower-cost models. DIR in 2018 was much more heavily weighted relative to Generic Dispensing Rates as opposed to quality of patient care or medication adherence. All indications are that this will not change in 2019 as payers continue to value financial gains over patient outcomes. Further complicating matters for pharmacies is that, all too often, it is unclear who they are being measured against in some of these DIR calculations. With pharmacies’ lack of access to data, they are sure to have difficulty predicting and managing their margins. Transparency is a critical need. It’s disappointing that there is no financial incentive for pharmacies to commit additional resources to improving adherence, given their unique ability to influence patient behavior. Better adherence drives better patient outcomes, which drive down overall health care costs. It’s a simple “formula” for shared success. Unless the payer is covering the entire cost of health care for the patient over an extended period of time, there isn’t a financial win for them either. Everyone wants to pass the responsibility to the future payer. We have to start paying attention to the whole. Our short-term thinking is risking our nation’s financial health in the future for everyone. Collectively, pharmacies have the lowest earnings of any segment in the health care industry. Yet this segment has, arguably, the greatest opportunity of any provider-set to educate patients, change patient behavior for the better and drive outcomes that will bring down health care costs for everyone. Let’s all support the National Association of Chain Drug Stores and the National Community Pharmacists Association in their shared mission in Washington to help resolve the issues created by uncontrolled — and increasing — DIR. Lari Harding is vice president for product strategy and marketing at Inmar.